Mels Maryon, a Dunmer nightblade, is a devout worshipper of the Daedric Prince Azura and can be found with his fellow worshippers Ralsa Nethan and Bur-Meema at Azura's Shrine. Have a chat with Mels to find out what unique gift Azura favors. He is essential until the shrine's quest is completed. Mels spends all day and night worshipping Azura, never leaving the shrine. He splits his activities between wandering around the shrine and relaxing on one of the benches. He, like most daedric worshippers, has very little in the way of worldly possessions and only wears a monk's robe and rough leather shoes. He has an iron dagger at his side to protect him. He also carries a few gold coins. Mels knows a leveled set of nightblade spells, as well as one extra major Alteration spell. When you first start a conversation with him, and you have not yet summoned Azura he will say "You have entered a holy place. What is your business here?" If you ask him about Azura he will only provide the necessary information if he likes you; otherwise he will reject you: "These are dark times, and people's minds are poisoned by rumors and superstition. Unless you can persuade me of your good intentions, I cannot speak further on this matter." If you raise his disposition accordingly, he will welcome you to the Shrine: "This is the shrine of Azura, Queen of the Dawn and the Dusk. What is your business here, traveller?" which will lead to two options; "I wish to summon Azura", or "I'm passing through". If you choose the latter he will respond with "Then be on your way, lest you anger the Lady." If you choose the former he will reply "If you wish to speak to the Lady, visit her shrine at dawn or dusk. Leave her an offering of glow dust, and perhaps she will deign to speak with you." Once you have approached the Shrine, Mels will say: "The Great Lady has spoken... to you alone. The moon and star shall be your guide." He will also provide a bit of info on your task at Gutted Mine: "There our brethren destroyed the vampire Dratik, but all were infected by the abomination, and were doomed to turn themselves. It was then that Azura, may She bless our days, sealed the cavern, protecting the world from the monstrosities within. It has been sealed ever since." Several citizens of Cheydinhal will mention Mels and his fellow worshippers, and defend their right to worship a Daedric Prince. 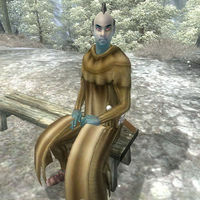 Trayvond the Redguard will say: "Daedra cults aren't necessarily evil, of course. In nearby Morrowind, for example, they worship Daedra in the Temple. The Azura shrine north of town, up Lake Arrius way, for instance. I know a Dark Elf there. Nothing evil about him." Ulene Hlervu, an open critic of any kind of worship, will comment: "The Azura coven in the Jeralls north of Cheydinhal... nice folks. Nothing like the blood-drinking Daedra worshippers everyone raves about. A waste of time, of course, worshipping gods in the first place. But at least they're not raving lunatics." This page was last modified on 4 January 2019, at 03:50.